Relaxed slate coloured dress with elasticated waist and side pockets. Round neckline, rolled dolman sleeves. Model wears a size 36. 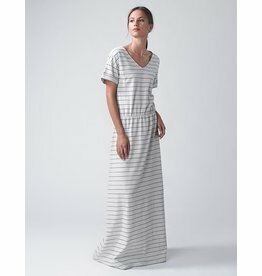 Yves dress is an ankle long dress with navy horizontal stripes, elasticated waist and a pocket on the top. V neck and rolled sleeves, ideal summer dress, relaxed fit.